John ? 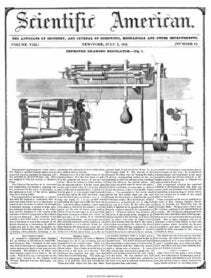 Anderson, of this city, has invented a balance throttle or regulator valve for which he has taken measures to secure a patent. In his constructien two cylindrica valves are used, which are made to balance each other perfectly, and are made to operate vertically, the steam being admitted through one valve in its downward motion, and the other in its upward motion—to the same end of the cylinder of the engine—and vice veisa to the opposite end, in this manner the steam may be admitted with any amount of rapidity required, and the regulator and consequently the valve will be affected by very slight chnm;es in the speed of the engine.